This book assembles some of the most exciting scholars working in the field of history to explore the theme of ‘power’ in history – examining the complexities, controversies, and contradictions of power and its contested environments in relation to warfare, the state, race, religion, gender, class, linguistic and cultural hegemony, symbols and rituals, and visual arts and architecture. It ranges from the medieval period to contemporary times, principally in Ireland and wider Europe, but also extending to North America, Africa, and Oceania. Categories: 19th Century History, 18th Century History, Pre 18th Century History. This book assembles some of the most exciting scholars working in the field of history to explore the theme of ‘power’ in history – examining the complexities, controversies, and contradictions of power and its contested environments in relation to warfare, the state, race, religion, gender, class, linguistic and cultural hegemony, symbols and rituals, and visual arts and architecture. It ranges from the medieval period to contemporary times, principally in Ireland and wider Europe, but also extending to North America, Africa, and Oceania. The 15 contributions do not accept power as a historical given. Each author addresses the specific context, giving rise to different constructions of it and its legitimacy, whether based on violence, political writings and rationalism, religious belief, popular acclamation, or visual perception. The collection brings out the different meanings and nuances of power over time and in different geographical spaces. 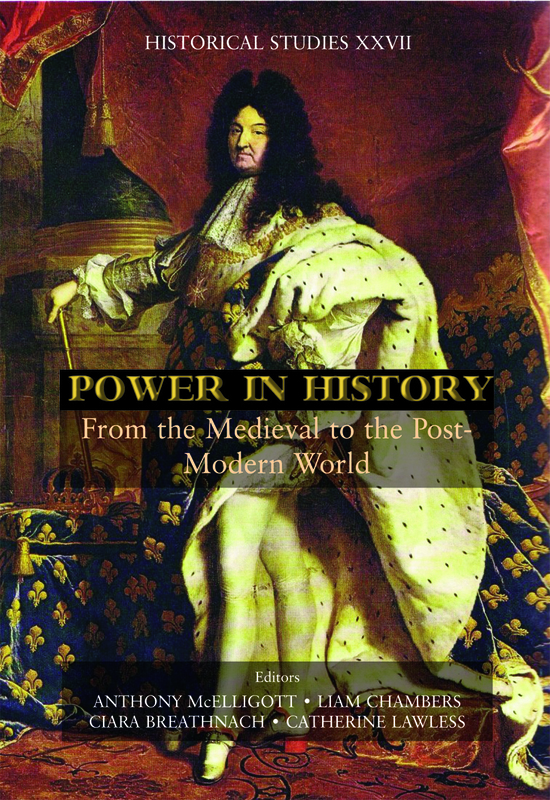 As the editors argue in their conclusion where they look at the meaning of power in the post-modern age, the findings of this book have a reach beyond the academic and should resonate with all those interested in the exercise of power in the modern world. Professor Anthony McElligott is Professor of History at the University of Limerick and an Editor of Cultural and Social History: Journal of the Social History Society. Dr Liam Chambers is Lecturer in the Department of History at Mary Immaculate College, Limerick. Dr Ciara Breathnach is Course Director of the History of Family at the University of Limerick. Dr Catherine Lawless is Course Director of the MA in History of Art and Architecture at the University of Limerick.